Published: Feb. 7, 2013 at 03:23 p.m. 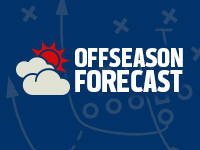 Updated: March 4, 2013 at 04:44 p.m.
With the offseason officially under way, Around The League will examine what's next for all 32 teams. The series continues with the Miami Dolphins. Joe Philbin has managed to keep his coaching staff largely intact, which will be beneficial in helping build on a solid foundation in his sophomore season with the team. What will be changing, though, is the Dolphins' roster, as Philbin and general manager Jeff Ireland look to add playmakers on offense to upgrade the league's 27th-ranked scoring attack and give second-year pro Ryan Tannehill the tools he'll need to develop. » LT Jake Long: Long's injury-plagued past two seasons have diminished his value, but rookie offensive tackle Jonathan Martin was only adequate as his replacement when Long landed on injured reserve with a triceps injury. The Dolphins would be wise to look into exploring a deal to keep him. » CB Sean Smith: When Ireland traded away cornerback Vontae Davis in the preseason, it signaled the team's intent to keep the talented Smith. The fifth-year corner had the best season of his career under coordinator Kevin Coyle. If the Dolphins can't sign him to a long-term deal, they can't use the franchise tag either as the team officially tagged defensive tackle Randy Starks on March 4. » WR Brian Hartline: Miami's key offseason objective will be to find playmaking wide receivers to help Tannehill, but that shouldn't be at the expense of Hartline, who had a career-high 74 catches for 1,083 yards in 2012. Hartline can be a quality No. 2 receiver and become more of a playmaker with a legit No. 1 opposite him. 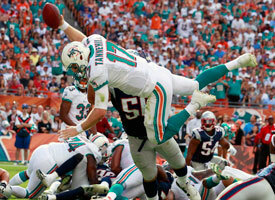 Check out the best photos from the Dolphins' 2012 season. Receiver is the Dolphins' most glaring need, but there are others, too. Defensive end Cameron Wake earned another trip to Hawaii thanks to his outstanding work throughout the season, but the Dolphins were unable to get consistent pressure from elsewhere on defense. Pass-rushing help must be near the top of their list. While Smith improved at corner, it was second-year pro Reshad Jones who looked like the most dangerous weapon in their secondary, and the Dolphins need to find someone else who can score points on defense ... perhaps Baltimore's free-agent safety Ed Reed would like to finish out his NFL career in Miami? Miami will be a player for one of the three big-name free-agent receivers, and with $44 million in cap space (currently third in the NFL), the Dolphins will have the money to do it. Greg Jennings seems the logical addition given his Packers past with Philbin -- although that didn't help Matt Flynn -- but at 29 years old and coming off an injury-plagued season, it might not be the best decision. Kansas City Chiefs free agent and Miami native Dwayne Bowe (also 29) had expressed an interest in coming home before signing a new contract with the Chiefs. Pittsburgh Steelers receiver Mike Wallace, therefore, could be the answer, and his speed certainly is something lacking in Miami's offense. If Long leaves, then a tackle will become a focus with the Dolphins' stockpile of five of the top 100 picks in the draft. Follow Henry Hodgson on Twitter @nflukhank.